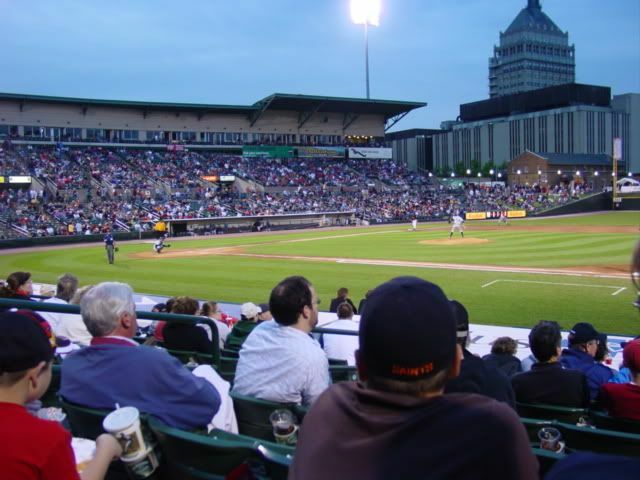 A weekend jaunt to Western New York took us to two of the remaining four professional baseball stadiums in the State of New York that we had not been to. 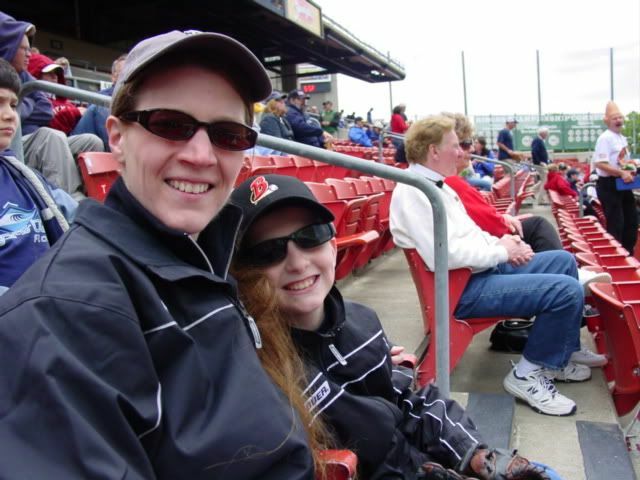 As a birthday present to Michael, we went to Rochester and Buffalo for baseball games, with a day at Darien Lake in between. We left on Friday after Michael came home from school, arriving in Rochester a few minutes before gametime. 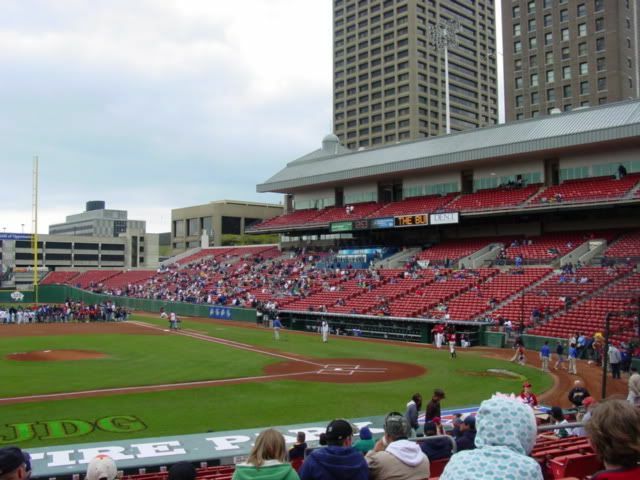 Having never been to Frontier Field, and reading some of the reviews of it online, we were actually pleasantly impressed with the stadium. Although on this night it was their largest crowd of the season (over 10,000 fans), it didn't seem crowded. The lines for concessions were long, but the concourse was wide enough to accommodate the lines and the fans walking around alike. We sat up on the first base side, above the Red Wings dugout and had a great view of the game and stadium. 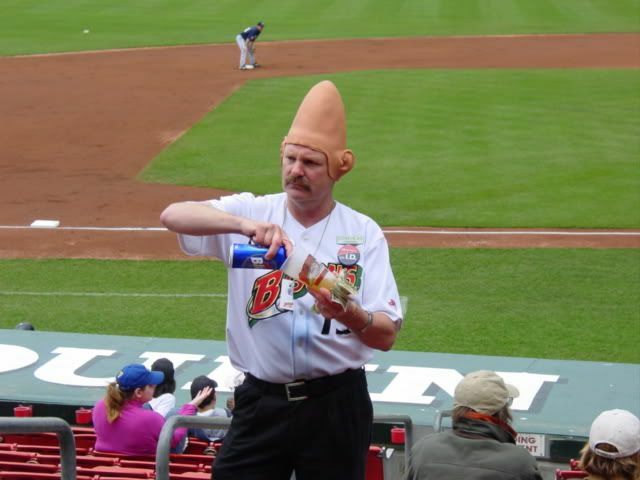 One thing that stuck out was the numerous concession options that they had at Frontier Field! Something for everyone that's for sure! After the game, we made the drive to Darien Lake Theme Park. Jill had made reservations at the hotel that was attached to the theme park, which made it very convenient for us to go back and rest our feet or change or drop off the multitude of stuffed animals that Michael won playing the midway games. Our day was spent here on Saturday, from open to close, going on the rides, watching Mike in the water park, playing games, and from time to time dodging the raindrops. We went on the new MotoCoaster a couple of times on Saturday (and once again on Sunday), Mike and I went on the wooden coaster there (more than likely the last one I will ever go on! Jill warned me! ), the swings three times, as well as the old fashioned cars. Sunday morning, we got up and had a quick bite to eat at the General Store at Darien Lake, rode the MotoCoaster and Old Fashioned Cars, Mike hit the batting cage for a couple of rounds, and then it was off to Buffalo. The second ballpark of the weekend was Dunn Tire Park in downtown Buffalo. Originally built with the expansion potential if the Buffalo area was able to land a major league team, this was by and far the largest minor league park we had ever been in. We had seats behind the dugout on the third base side. The food options here weren't as plentiful as those in Rochester, but I had my first fried bologna sandwich while watching the Bisons play and boy was it yummy! Todays game was a bit colder than the game on Friday as the wind blowing in off of the lake kept the temperature hovering in the mid to high 50's throughout the game. Wanting Mike to experience history itself, we went in search of (and found!) 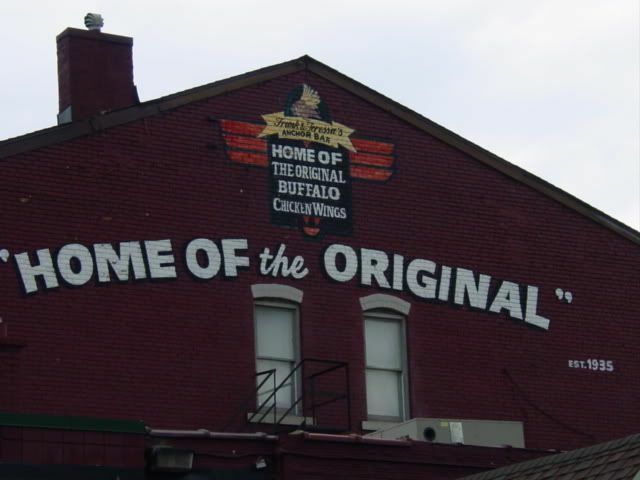 the Anchor Bar after the Bisons game - the ORIGINAL home of the Buffalo chicken wing! After downing a dozen and a half, we made the Garmin directed trek back home. Another view from our seats shot - this time at Dunn Tire Park! Would you buy a beer from this guy? YANKEES TOP WINGS 6-3 Eric Duncan's three hits and three RBI paced the first place Scranton/Wilkes-Barre Yankees over the Red Wings 6-3 at Frontier Field Friday night. The loss snapped Rochester's four-game win streak. Brian Buscher had three hits, and Darnell McDonald homered for the Wings. The Wings struck first on McDonald's home run in the first inning. McDonald hit the first pitch he saw from Scranton starter Jeff Marquez to left field for a 1-0 Wings lead. Randy Ruiz came across the plate for the Wings in the second inning on a bizarre play. After Scranton catcher Chris Stewart attempted to tag Ruiz, the ball popped out of Stewart's mitt, allowing Ruiz to score and the Wings to go up 2-0. The Red Wings increased their lead to 3-0 later in the inning, when Jose Morales scored on an RBI groundout by Tommy Watkins. The top of the third inning saw the Yankees get on the board against Wings starter Brian Duensing. Eric Duncan homered to center, cutting the Wings lead to 3-1. The Yankees had another scoring opportunity later in the inning with runners on first and second with two outs. However, Ben Broussard flew out to left field, which brought the inning to a close The Yankees scored again in the top of the fifth. Bernie Castro lead off the inning with a single, and Brett Gardner followed with a double to left field. Alberto Gonzalez drove Castro in on a sacrifice fly, which made the score 3-2 in favor of Rochester. However, Duensing recorded back-to-back strikeouts of Jason Lane and Broussard to end the inning without any further damage. In the bottom half of that inning, the Wings loaded the bases with no outs, thanks to singles by Watkins and Jason Pridie, and a McDonald walk. The Wings failed to take advantage of the situation, as Buscher's grounder in front of the plate turned into a double play, and Ruiz grounded out to end the inning. Casey Daigle relieved Duensing in the top of the sixth. Daigle began the inning well, striking out lead off batter Nick Green. However, after a Greg Porter double, Watkins misplayed a fly ball hit by Duncan. 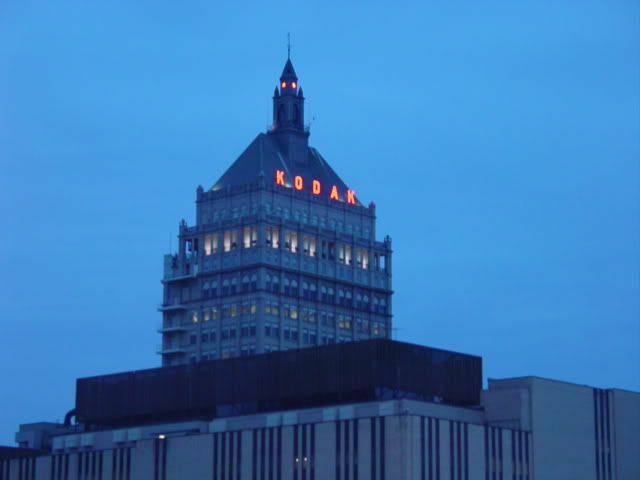 Porter scored on the play, knotting the game up at 3-3. . Scranton took the lead on another fielding miscue by Rochester later in the inning. Bernie Castro hit a fly ball to center field, which Pridie misjudged, allowing Duncan to cross the plate to give the Yankees a 4-3 lead. Scranton increased their lead to 5-3 in the top of the eighth. After Porter singled to lead off the inning, Chris Stewart advanced Porter to second on a sacrifice bunt. A wild pitch by new Red Wings pitcher Tim Lahey allowed Porter to move to third. Duncan drove Porter in with a RBI single, Duncan's third of the game. The Yankees scored another run later in the inning. After a Castro single, Lahey intentionally walked Gardner to load the bases. After striking out Gonzalez for the second out of the inning, Lahey walked Lane, allowing Duncan to cross the plate, making the score 6-3. Jeremy Sowers was the picture of precision for seven innings Sunday, operating like a human pitching machine. Pop a quarter in the slot and watch pitches buzz around the strike zone. Columbus Clippers starter Mike O�Connor dabbled around the sweet spot of the plate as well, but the Buffalo Bisons humbled O�Connor with a pair of home runs by Josh Barfield and Aaron Herr in surging to a much-needed 2-1 victory Sunday afternoon in front of about 7,000 (9,181 tickets were sold) at Dunn Tire Park. Sowers (4-3) allowed eight hits while striking out five with one walk. Eight of the 21 outs he recorded came on ground balls. The only run against him came in the seventh inning on a play where home plate umpire Damian Beal initially called Yurendell de Caster out at the plate, then changed the call and indicated he was safe. Bisons manager Torey Lovullo went ballistic and was tossed from the game for arguing with Beal. Lovullo�s quarrel with Beal notwithstanding it was an otherwise trouble-free day for the Bisons (26-31), who ended a three-game losing streak, thanks to the unflappable Sowers. Sunday�s outing was nearly a carbon copy of the one the lefthander tossed last Tuesday at Toledo when he pitched six scoreless innings and gave up eight hits with five strikeouts in a 6-2 Bisons victory. Sowers operates as if he barely has a pulse. Take the fifth inning where he worked into a bases-loaded jam with one out. He caught Tommy Murphy looking at a fastball on the outside edge of the plate before David Wallace grounded into a force out at second. In the sixth, the Clippers started with singles by Ed Rogers and Kory Casto, but Alex Escobar hit into a double play and Frank Diaz popped out to first. Until the fifth, Sowers had faced the minimum 12 batters. �You have to keep them from extending innings,� Sowers said. Tom Mastny pitched a scoreless eighth inning before Rick Bauer came on in the ninth for his 15th save. In today�s Kids� Day series final at 10:35 a. m., the Herd will send Matt Ginter (3-4, 4.92) against Columbus right-hander Garrett Mock (2-2, 3.05).